Well, what is taiyaki anyway? Literally, it means “fried fish,” combining “tai” (a type of fish) and “yaki” (fried—recall other familiar culinary uses of it in okonomiyaki, takoyaki, etc.) The tai fish, or sea bream, has been considered “king among fish in Japan,” so you’re dealing with royalty here. Outside of literal translation land, taiyaki is known in Japan as a fish-shaped pastry, made from pancake or waffle batter and commonly filled with red bean paste. Fittingly, the tai fish turns a reddish hue in the months of March and April. They’ve really thought this stuff through. But enough background info: What am I going to be putting in my mouth? Simply, it’s soft serve + toppings stuffed into the mouth of a golden taiyaki, acting essentially as a twist on a waffle cone. The fish’s tail is filled with either custard or red bean filling, so you’ll be starting and ending your experience with something sweet. This creamy, seafaring treat is fairly new to NYC. At East Village street food shop Otafuku X Medetai, you can get medetai, i.e. fish pastries filled with red bean or nutella and banana, but without the soft serve. And recently the Internet got fired up about Ice & Pan‘s taiyaki creations, but that’s all the way in Flushing, and there are a lot of lazy people in this world who are more likely to associate 7 with a lucky number than a train. At Taiyaki NYC, folks will be able to choose from several pre-made creations. Or you can construct your own fishy friend by choosing one of six soft-serve flavors, deciding between custard or red bean filling for the fish, and picking two toppings (from classic rainbow sprinkles to mini mochi) and a drizzle of something on top: condensed milk, caramel, chocolate, or red bean. If you have a proclivity for ultra-American (some may say “boring”) combos like vanilla and chocolate or just want to eat as much matcha-flavored stuff as you possibly can, these folks have got you covered. Might as well try both—for their grand opening today, they’re doing a buy one, get one special. If for some reason a soft yet crisp golden pastry in the shape of a fish is too much for your senses, or reminds you of a bad experience with fish you had in your youth, Taiyaki will also be serving their soft serve in cups. For the wimps! Well, I guess it is $3 cheaper. And for the vegans and lactose-intolerants of the world, or even those people who think they’re fine but just occasionally get searing stomach pains when they shovel the dairy in particularly hard, your time is not here yet. 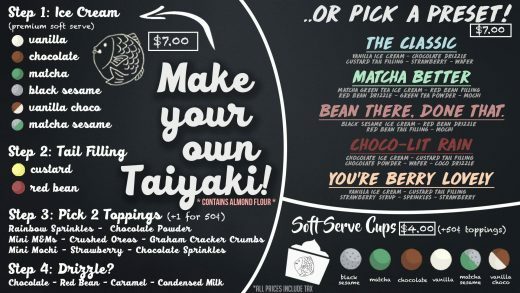 Taiyaki doesn’t have any non-dairy options at the moment, but they’ve noted on their Facebook that they’re in the works to offer a “soy-based organic soft serve” in the future. 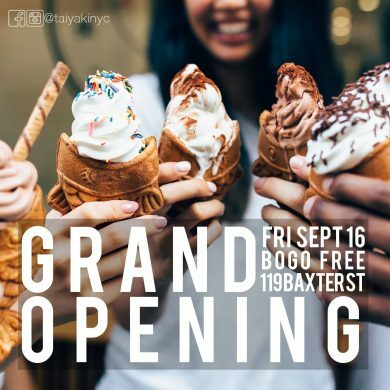 Taiyaki NYC is having their grand opening today at 119 Baxter Street, and will be offering a BOGO special all day, now until 10 pm.